Hematopoietic stem cells (HSCs) are a class of stem cells located in bone marrow. HSCs give rise to every type of blood cell—from the red blood cells that carry oxygen to the white blood cells of the immune system. Bone marrow provides a niche that both houses and regulates HSCs to ensure proper formation of blood cells. However, the precise mechanisms that maintain the HSC niche are not fully understood. The researchers found that a protein involved in regulating gene expression, called Ebf3, is highly abundant in CAR cells of mice. 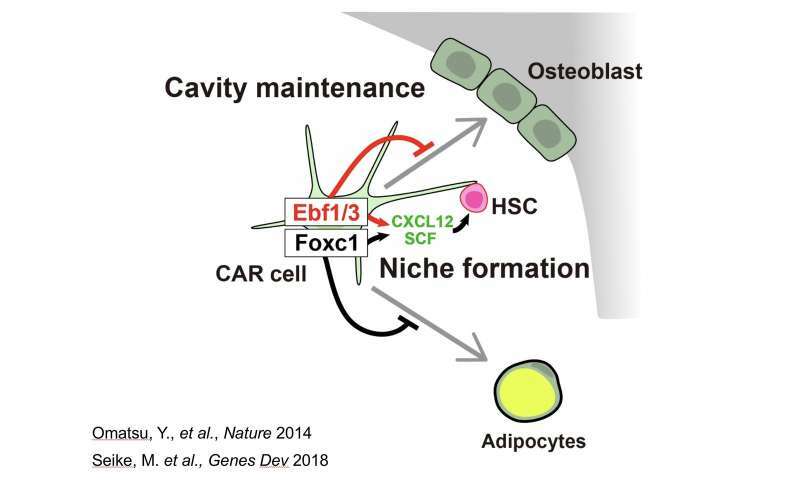 When they removed the gene that produces Ebf3 from these cells, they saw a significant decrease in the number of HSCs in the bone marrow—as well as some other, more surprising effects.